Well, that was disappointing. I thought it was something better than that. Something that maybe actually made sense. I am not a horsey person. I read one horse book when my adolescent friends were six books deep in that series about the wild horses of Chincoteague. 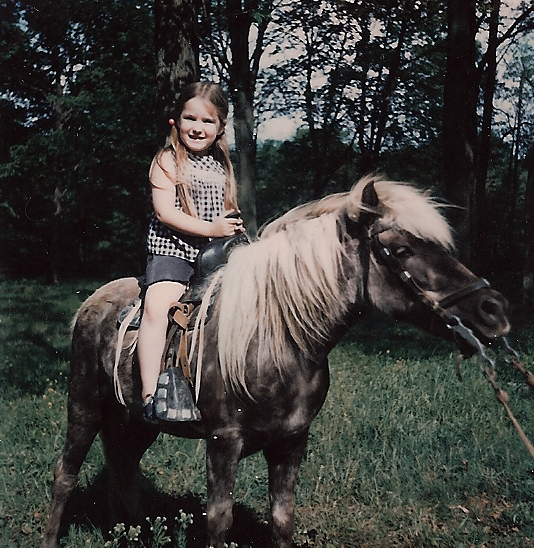 I inherited a ceramic horse collection from someone who had outgrown it, but I never went through a horse phase like a lot of girls do, unless you count my beloved rocking horse, Charger, who betrayed me by getting too small to ride. I’ve ridden exactly one non-plastic horse, a pony really, and I did not feel like we were of one mind. I did not feel whatever it is that horse people feel. The view was nice and I wished I had one, but that was largely about transportation because I was six and a horse could take me anywhere I wanted to go. What a horse could not do, however, was make itself comfortable in a one-bedroom upstairs apartment. I’m in awe of people who ride horses regularly the way I’m in awe of people who ski. It looks like fun at some level, but skis and horses have always struck me as situations you only think you have control over, and so I’ve given both a miss. Life is precarious enough in my mind without me putting my body on something that could gallop me over a cliff or skid me into a pine tree. For these reasons, I don’t think of horses as metaphors when I’m writing because they mostly just aren’t in my consciousness. They’re lovely and powerful and I like the way they smell when I have occasion to smell them once every five years when I find myself in the horse barn at the Great Darke County Fair. But I’m more of a dog and cow person. Maybe a monkey person if I’ve had caffeine. Around the same time, a friend of a friend told me the sad story of having to say goodbye to her horse. (She was moving or the horse had to move, the specifics I have forgotten, though—because she was a rare creature like I was in the early 1970s, which is to say a child of divorce—I blamed her loss of horse on her parents’ failed marriage). Her horse was long gone when I met her, yet she spoke of how on the last day with it, she sat in the saddle wearing some special riding hat, maybe covered in flowers, and her friends stood around her and sang. Her longing for the horse was still palpable. It’s been decades since this vicarious heartbreak, but still, I imagine her there, sitting on a horse I never met, weeping because her other half was taken from her. Leibovitz recently did a photo shoot with her beautiful 16-year-old daughter in a beautiful, ethereal dress on a beautiful chestnut horse. Though it pained me to see Baby Leibovitz looking all grown up, it pleased me more to see her—at this age, as she’s just figuring herself out—on one of the horses she’s loved since she was a tiny girl and she was looking very much herself. Also, I just watched a Martin Clunes documentary on heavy horses (watched largely because I like Martin Clunes and not because of the horses), so I can only assume this “genius” phrase of mine was inspired by these two recent equine-related occurrences—a photo of a favorite kid and a documentary narrated by “Doc Martin”—but goodness knows what I thought I’d do with Horses aren’t arbitrary when I wrote it down. It doesn’t really inspire the Great American Novel. And clearly “blog about horses” isn’t even possible since right now I’ve said all I have to say about horses and we haven’t moseyed down the trail towards anything close to a point. I’m stuck. My non blog-writing has been refusing to shape itself into anything resembling coherence. I sit (sometimes) at my gorgeous desk with my city view surrounded by all of my helpful books about writing and other books full of writing that inspires me, and yet I am stuck. I spend too much time looking backward instead of forward even though if you asked me (you’re asking, right?) I would tell you that this moment right now and the moments surrounding it are absolutely the happiest period of my life. Also, fall is approaching. I’m three years out of teaching. While I don’t miss lecturing, obsessive faculty meetings, or some administrators who will remain perpetually in my Little Book of Hate, I miss my students. God I miss them. I miss talking to them about their writing and how to make it sing. I miss watching them take some truly deplorable crap and sculpt it into something beautiful. I miss them popping into my office to talk about their ideas or ask for advice. I miss hearing their thoughts about some piece of literature, telling them mine, and all of us seeing the text in a new way. I miss recognizing people in some other major during first year comp and knowing they were meant to be in my classes, and then later having the satisfaction of them stopping by my office to say they’re thinking of switching majors to English. And later still, seeing them in their last semester, finishing up a creative writing portfolio or an Honors Thesis that exceeds both of our expectations. I even miss having those dreaded conversations during advising sessions about the uselessness/utility of an English degree. My first and favorite office. In short, I don’t really know who or what I am these days. It might be a midlife crisis. Or it could just be something I ate.I’ve always been better at knowing what I’m not than I have been at knowing what I am. It occurs to me that the reason I’ve remembered these horsey stories for forty years is not because I particularly wanted a horse myself, nor is it because I wanted to be like my idol mystery-solver/horseback riding heroine, Trixie Belden. I don’t even want to climb upon a horse for a photo op (largely because I’m unsure that horses really want to be climbed upon in the first place). No. The reason I can still see my cousin on her horse or imagine the friend of a friend weeping on a horse I never met is because I quite liked the idea of being a horse girl. Horse girls always know exactly what and who they are. 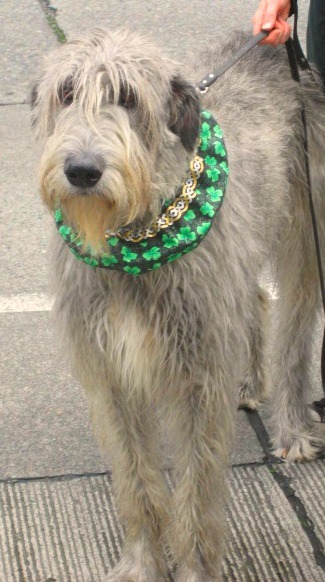 Their heads are full of horses and there is no dissuading them or convincing them that an Irish Wolfhound is nearly as big and just as good. They love their horses so much they don’t mind mucking out a barn, swatting horse flies, or doing those 800 things you have to do to keep a horse happy and healthy (things I used to know when I was reading Trixie Belden). There’s no question there. 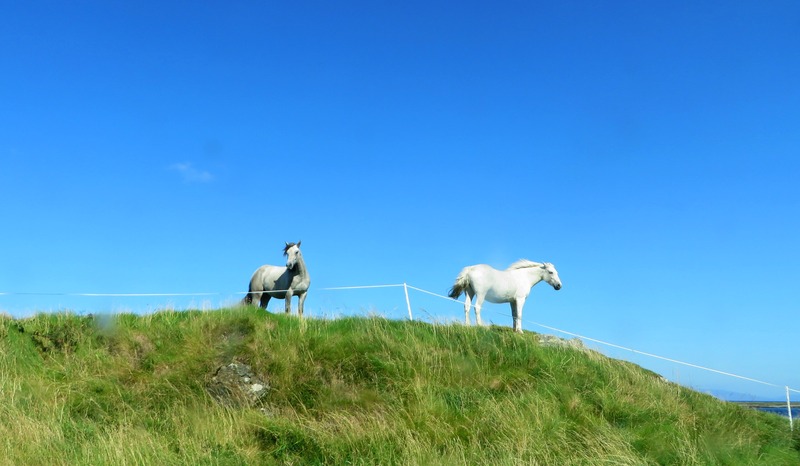 They want to be on the back of a horse, or standing next to a horse with curry comb, or in a house that is adjacent to a barn in which a horse resides. Even now, when I run into my cousin at Meijer or see a Facebook post from that friend of my friend, the first thing I think: horse girl. And the second thing I think: I wish I knew myself as well as you always have. Nice post. I miss having instructed writing and assignments. While my education has helped in crafting better outlines and instructions for the training webinars and other content I create, those writings do not hold a candle to the personal growth I found with creative writing. Horses are not arbitrary for many. There is an inherent fascination for the equine inclined to communicate with a horse. Will it let me come near it? Will it let me touch it? Will it trust me to put a rope around its neck, then fasten a halter to its head, trust me to lead it away from its friends, into a barn, into a stall, into a trailer, take it somewhere new? Will it like this gear, this footing, this type of work, this trail I chose for it? And above all, will it come to see me as a leader? Horses are awesome at instinctually following a leader. Gaining trust and being accepted as a leader is like a litmus test between being a passenger in the saddle and being a partnership with each horse. I guess it is a language or skill set that we want to hone into creating a partnership and trust with something that is naturally wild and free, that chooses to go where its kind want to roam, and instinctually wants to be in its herd, and bend that instinct to include us as part of its society. They are particularly appealing to persons who enjoy silent communication, and understand willingness is the ultimate training goal. And yes, it is always kind of exciting to not know what might come next. Many horses do indeed enjoy being ridden. A good ride for them is positive reinforcement and the attention they crave. Some even sulk if they are left behind or left without attention for too long. See, all of that. When I read about what it is to work with a horse, I understand it, but I also know that I am inherently _not_ a horse person, largely because I know if I were a horse I wouldn’t trust me. It feels like a personal failure of some sort. FYI, I tried yesterday to work in reference to the gorgeous essay you wrote about rescuing horses but I got fed up trying to sandwich it in somewhere. It’s still one I remember well! I am truly flattered my writing is remembered. It is such a compliment! Thank you. That was a great piece. Did you ever send it out? You should have. I can remember specific scenes and lines. It was really well done. “Horses aren’t arbitrary” is clearly a call to writing poetry. 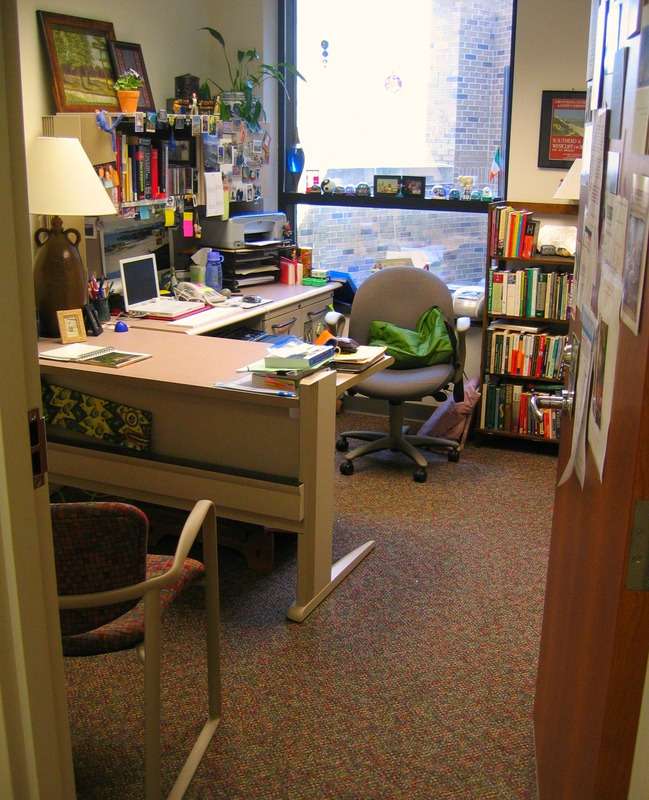 Seeing your office, now empty of you, made me sad. I miss you and your incomparable ability to make me guffaw….silently…but guffaw nonetheless. The only other writer who makes me laugh in this way is James Thurber. Thanks, Lee Ann! I miss those Springwood Hall days. And I’m glad I make you laugh and feel honored to keep such good company in your head! This post has made my day–and I’ve had an amazingly wonderful AND completely exhausting and frustrating day. I’m sending this post on to 2 friends–a horse girl, and a writer. They will each be enchanted. I read this with such joy and wonderment at how you absolutely nailed it — nailed me! I still have no clue my place in this world but you are so right…I do know that I must have a horse in my life. The stomp of a hoof, the sound of them crunching hay, a distant whinny, or even the faintest smell of them makes my heart leap with joy and my world centered. You are an amazing writer, my dear cousin! I find myself laughing out loud or nodding my head in agreement the entire time I am reading your blogs. Please never stop!! !